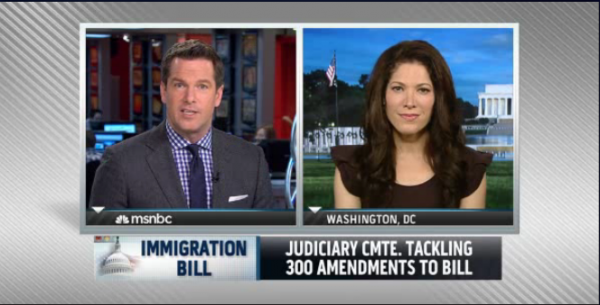 What happens when Senators tack on 300+ amendments to the immigration bill? You have a lengthy mark-up process that continues for weeks. This is a good thing. The so-called Gang of Eight legislation is nowhere near perfect and may never be. But this process is crucial. We must debate which requires becoming informed. We must compromise because we are a democracy and not a dictatorship. We must vote because this is the participatory result of being informed and reaching consensus--not for me but for us. I joined Demos' Heather McGhee and MSNBC's Trymaine Lee to discuss this topic, student loan rate resets, and the latest data on the minority vote on MSNBC's Thomas Roberts Show. We also talked about the challenges the Republican party is facing with diverse communities, especially Hispanics in light of the Heritage Foundation immigration report controversy which I write about in "Latino IQ Quiz: Does the GOP Hate Hispanics? a) Yes b) No c) Maybe d) Can You Repeat?" This segment aired May 9, 2013. If the immigration bill passes, how will it look?